This sale is applicable on one-way and return travel in economy and premium economy classes, Vistara said. Vistara is also offering in-flight enhancements on select flights with its new Airbus A320Neo airplanes. Vistara is offering all-inclusive economy class fares starting at Rs 849 in a limited-period promotional scheme aimed at the monsoon season. 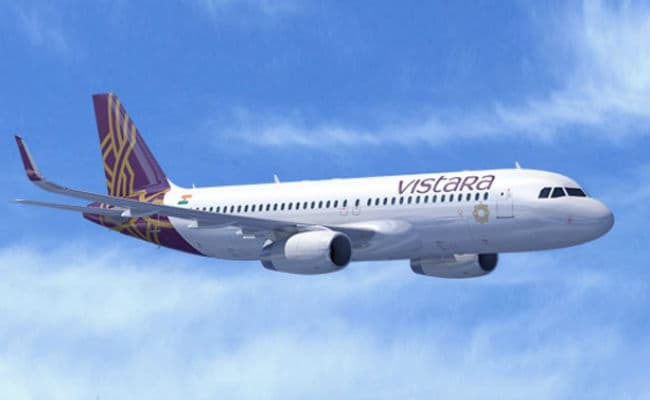 Applicable on travel between June 28 and September 20, Vistara's "Great Monsoon Sale" - open for five days - also offers tickets from Rs 2,099 for premium economy seats, the airline said on its website. Vistara, a joint venture between Tata Sons and Singapore Airlines, said bookings under the Great Monsoon Sale are open from June 13 to the midnight of June 17, 2017. Vistara's special fares scheme covers destinations including Goa, Port Blair, Leh (Ladakh), Jammu, Srinagar, Guwahati, Amritsar, Bhubaneswar, Delhi, Kolkata, Mumbai and Bengaluru. "With Vistara, the fares are always what-you-see is what-you-get, with no hidden fees and fuel surcharges," the airline added. 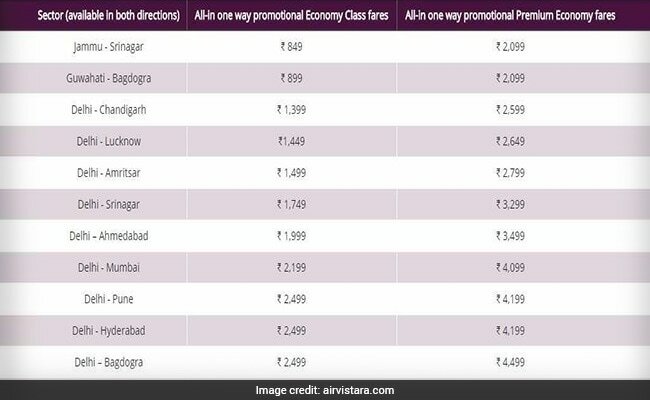 This sale is applicable on one-way and return travel in economy and premium economy classes, Vistara said. "This sale is valid on direct flights and is applicable for sale in India only." Also, Vistara is offering the Rs 849 Economy class tickets on one-way the Jammu-Srinagar route. Vistara is also offering in-flight enhancements on select flights with its new Airbus A320Neo airplanes. Select flights between Delhi and Mumbai as well as Delhi and Srinagar will offer new features including mood lighting, softer leather seat upholstery, improved seat cushions and new boarding and landing music under a promotional campaign "#NotJustAnotherNeo". The Great Monsoon Sale is applicable for bookings made 15 or more days in advance. Bookings for the sale can be made at the airline's website - airvistara.com, mobile apps (available for iOS and Android), Vistara Airport Ticket Offices and through its travel partners, it noted. Without divulging the number of special fare seats under offer, Vistara said: "Seats are limited, grab them before they are gone! ... Based on the availability of seats under the sale, fares reflecting on www.airvistara.com and mobile app are the discounted sale fares." Many airlines are offering hefty discounts on fares ahead of a lean season starting July, some analysts said. Rival airline IndiGo is offering all-inclusive fares below Rs 900 in a limited-period scheme open till June 14. Valid on select one-way routes, IndiGo's Rs 899 offer is applicable for travel between July 1 and September 30. Domestic airlines carried 364 lakh passengers during January-April 2017 as against 309.35 lakh in the corresponding period a year ago - an increase of 17.71 per cent, according to data from Directorate General of Civil Aviation. The passenger load factor in the month of April 2017 showed an increasing trend compared to previous month primarily due to beginning of holiday season. Meanwhile, in a recent post on microblogging site Twitter, Vistara advised its customers "to report for check-in 120 minutes before flight departure to ensure they do no miss their flights".